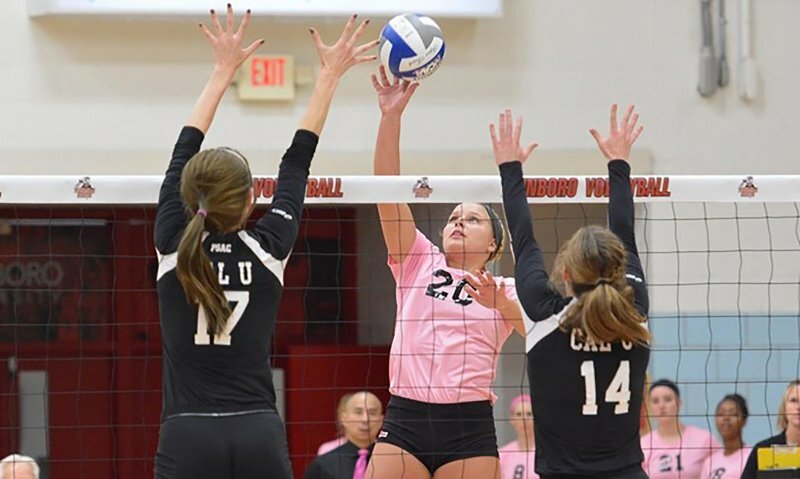 Edinboro swept California (Pa.) in PSAC quarterfinals on Tuesday night (Contributed photo/EU Sports Information). Boro, the top seed in the west for the first time since 1997, swept #4 California (Pa.) in three sets, 25-10, 26-24 and 25-17 to move to 31-5 overall and advance to the PSAC semifinals. The 31 wins are the most for an Edinboro women’s volleyball team since the 1990 squad won 33 contests. Coming into the match, head coach Missy Soboleski felt her team was ready, despite losing to the Vulcans on Saturday. “We focused of the first contact, we wanted to out serve them and out pass them and that’s what we did tonight,” she said after the match. Soboleski’s athletes felt the same, with a little added nerve. California (Pa.) started the night off with the first serve, with Boro scoring the first point with a kill from Litwiler, followed by an ace. The Scots kept Cal (Pa.) to 10 points in the first game, ending the game with two kills from Severo, two hitting errors by Cal (Pa.) and one kill from freshman Megan Screptock. Severo finished the first set with seven kills. The second game was a constant battle between the Scots and the Vulcans, resulting in the Scots coming out on top 26-24. Edinboro came back from a 22-18 deficit to get the win. Litwiler had two kills in a row, making the game 23-21 when Cal (Pa.) called a timeout. The Vulcans had the first kill off the timeout, making the game 24-21 in favor of Cal (Pa.). Litwiler answered with a kill of her own, making it a two-point game. With Litwiler serving, Cal (Pa.) had the next three hitting errors, giving the Scots the 25-24 lead before Litwiler finished the match with a kill that brought the crowd of 428 to their feet. “I think we just stayed focused and just kept working hard and didn’t really look at the score, we were just taking it a point at a time,” Severo said of the second game. The third game Boro came out strong with a 6-1 lead, but Cal (Pa.) battled back and got it close with a 12-11 lead when Sobolseki called a timeout for the Scots. Litwiler came off the timeout with a kill and an ace. The Scots and Vulcans battled back and forth until the Scots went on a run, from 16-15 to 22-15. The final game of the night concluded with a kill from Severo, followed by two aces of her own to wrap up the first round of PSAC play for the Scots. Soboleski explained her emotions about the victory. Litwiler finished the evening with 14 kills and six service aces, giving her a new team-high of 475 kills for the season. Her 64 service aces ranks her at seventh in a season. Severo added 10 kills to Tuesday’s match and three block assists. Sydney Trathen contributed 32 assists and has 1,254 assists for the season. Marah Maycock finished with 20 digs, boosting her season total to 568. “It was really a great team effort, great defense, great passing,” Soboleski said. The semifinals are up next for the Scots on Friday at 5 p.m. at Pitt- Johnstown against Shippensburg, the second seed in the East and also who won Tuesday night’s match against #3 West Chester, 3-2. The winner of this contest will advance to the PSAC championship on Saturday against the winner of PSAC-East #1 Pitt- Johnstown and #2 Clarion at 7 p.m.
After the match Tuesday night Soboleski said that her plan for the week is to, “look to the next one. I don’t know who we’re going to play.